Good grief. 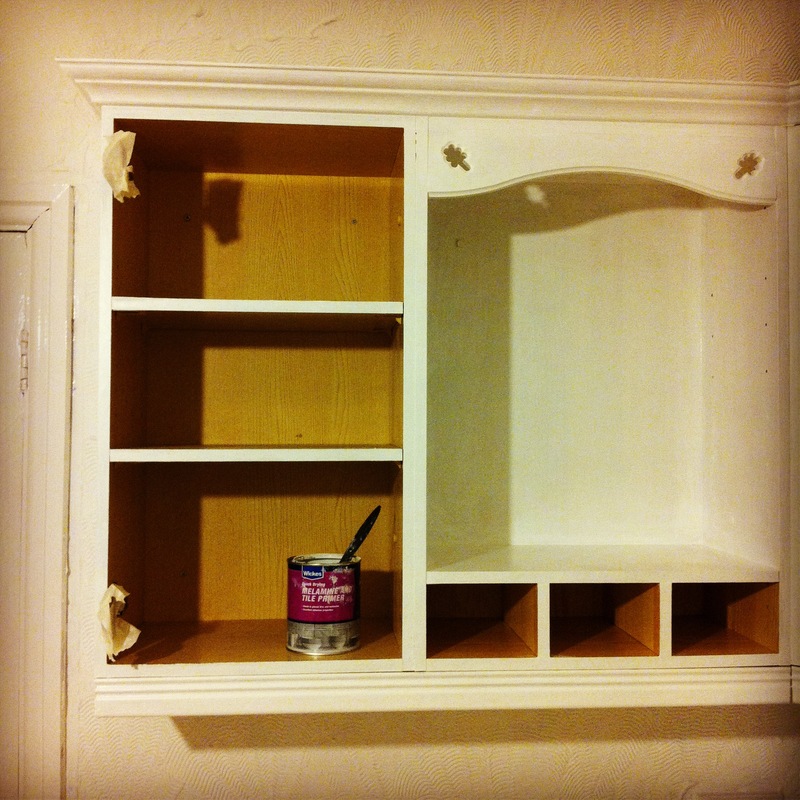 I know that everybody on DIY forums goes on about how boring kitchen cupboard painting is, but it is PROPER boring. And rather hard on the back. It doesn’t help that I’m doing it in brief snatches when small person is asleep (i.e. Sunday afternoon and school day evenings). But I’m getting there (except for the doors, which will be sprayed by a French polisher when he returns from his holiday). In other news, the decorators have finished, the builder’s coming on Thursday to complete his snagging list and the carpets are being fitted next Wednesday and Thursday. 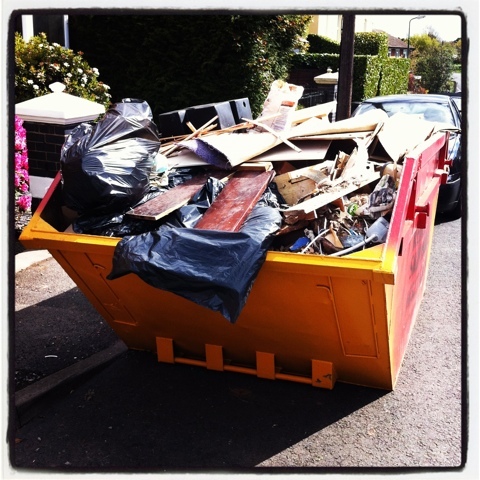 The removals people are also coming next Thursday afternoon to MOVE US IN! 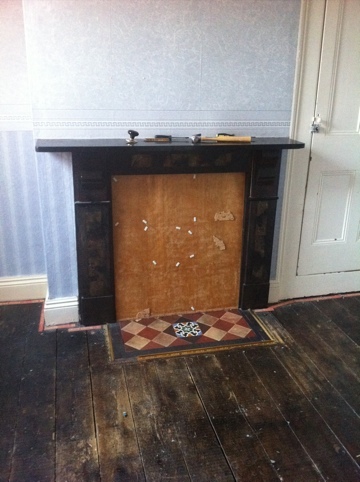 There is a small chance that the carpet fitters will still be working as the removal van arrives. But I’m sure it will all be fine (she said, smiling somewhat maniacally). 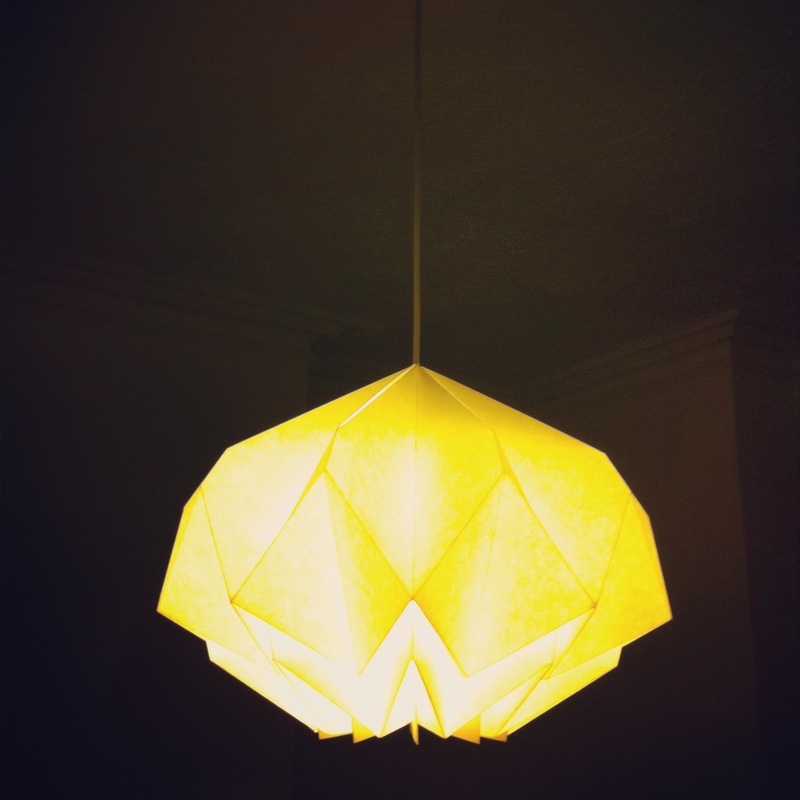 As I finished tonight’s painting session I needed a little lift, so I fitted the paper shade in the sitting room. I absolutely love it, particularly as it was the last one and reduced to £6. Yes, £6! I probably should have waited until we had carpet. But I did enjoy ten minutes’ day dreaming under it before I locked up for the night. 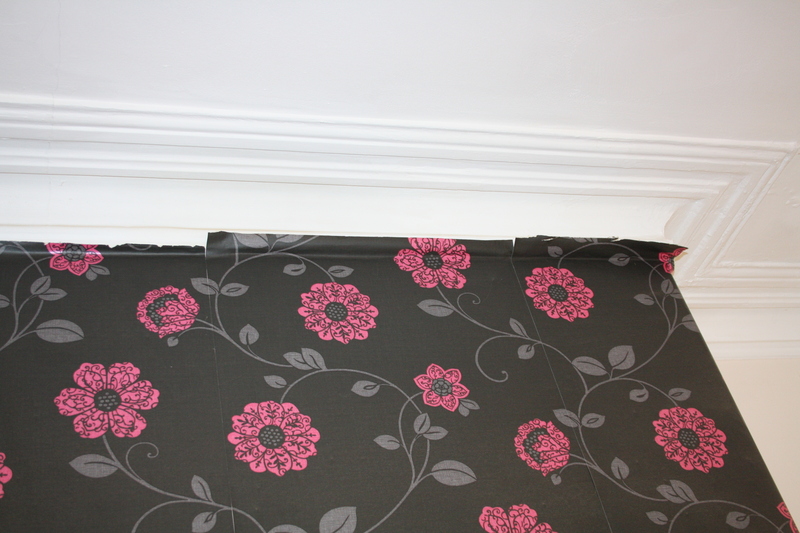 So finally a few before photos……..
As you can see the hideous wallpaper was put on with real care and attention! 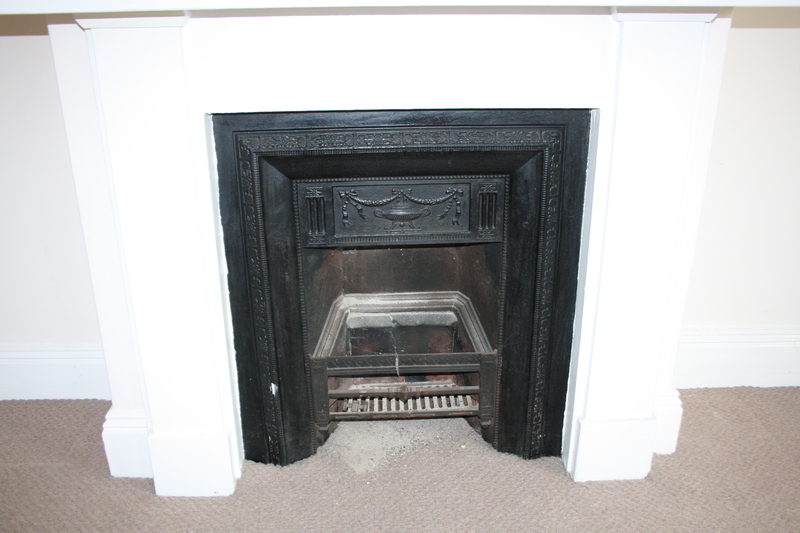 The stone fireplace was painted white and the cast iron insert had been painted with black gloss paint I think. 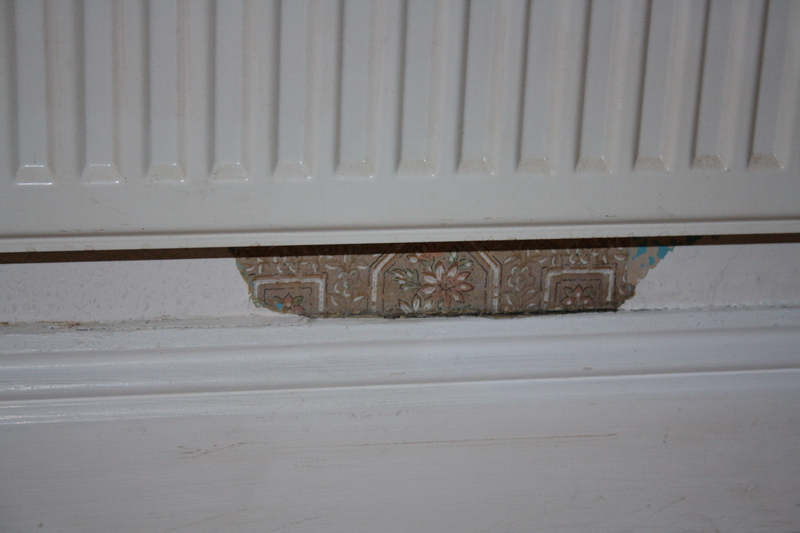 And under the radiator there was evidence of wallpaper from a long time ago! There is the remnants of a pull switch to control the big light which I am definitely going to restore to its former glory, there’s one in the spare room that we’ve been sleeping in since we moved in and it’s really useful and a bit retro i think! House and Garden via Dahlias, Dreams and Damask. I love the colours, in particular the rug, the white walls, the baskets either side of the fire (i might get some to keep my scarves in). 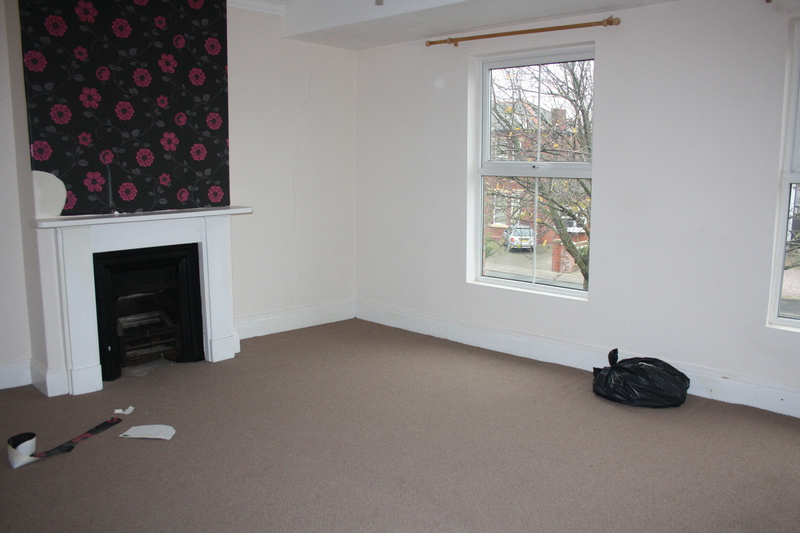 Lush floorboards and floor length curtain and mustn’t forget the lovely white walls! Really like the neutral aged walls, old suitcases (I’ve already started a collection for on top of my wardrobes), gilt mirror and beautiful chandelier. Looking forward to the completion of the blank canvas, not long to go now! Those poor blokes are still painting! I am so grateful that we don’t have to do it as there is a tremendous amount of work there. Every day I return to the house to check progress and love what I see, but I’ve been thinking, am I respecting its past? Reading the Victorian Society’s pamphlets on caring for a Victorian home I’m not too sure. Laeticia Lazerges' home via Design*Sponge - that tablecloth fabric is discontinued and I was green with envy when I saw it! *I love the Victorian Society but feel like a naughty schoolchild for using ‘modern’ paints, fitted carpets and lusting after a side return extension: all no-nos to them! 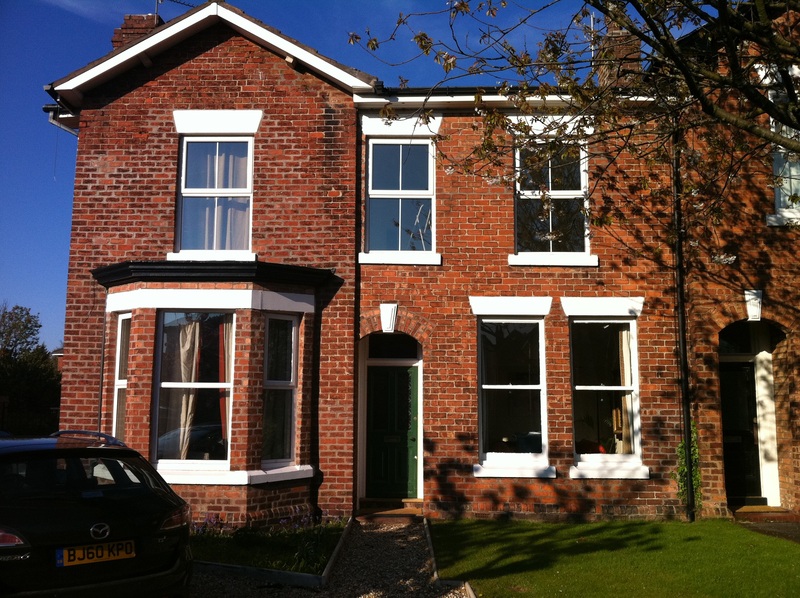 Our new home, a work in progress……. We moved in around 5 months ago and tangible renovation progress has been slow. We’ve spent time and money on lots of unseen things on the roof that, amongst other things, has made the house water tight again and allowed us to use one of the fireplaces having had the chimney stack rebuilt and a reclaimed pot put back on. 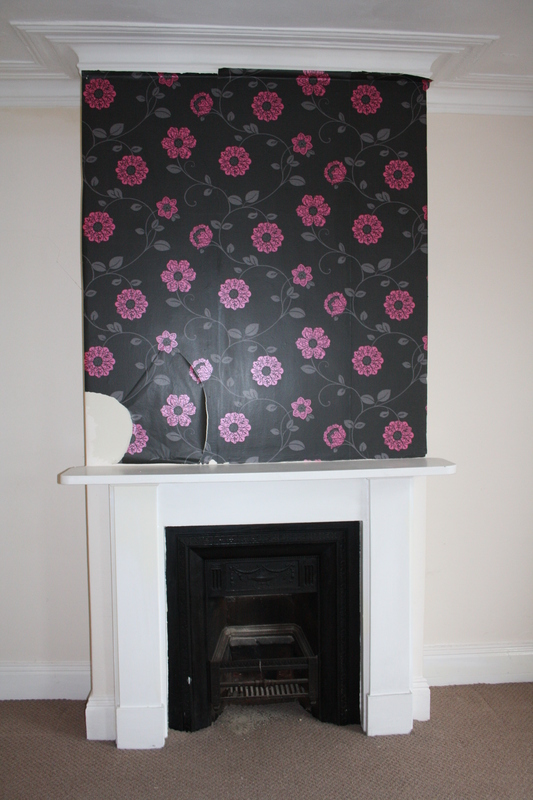 The first of 3 that need doing to enable us to use all of the fireplaces in the downstairs of the house and our bedroom. We also did a rush paint job on one of our reception rooms to cover up the mysetrious yellow staining on the lower walls (possibly dog wee – yuk!) so we could have Christmas dinner for the family in there. Overall our new home is livable but very tired having been rented out for a number of years and after rushed DIY efforts in the past, and regrets over not having done things properly the first time, we have decided a one at a time approach to each room is the way to go to get things right and stay sane whilst living amongst all the mess. 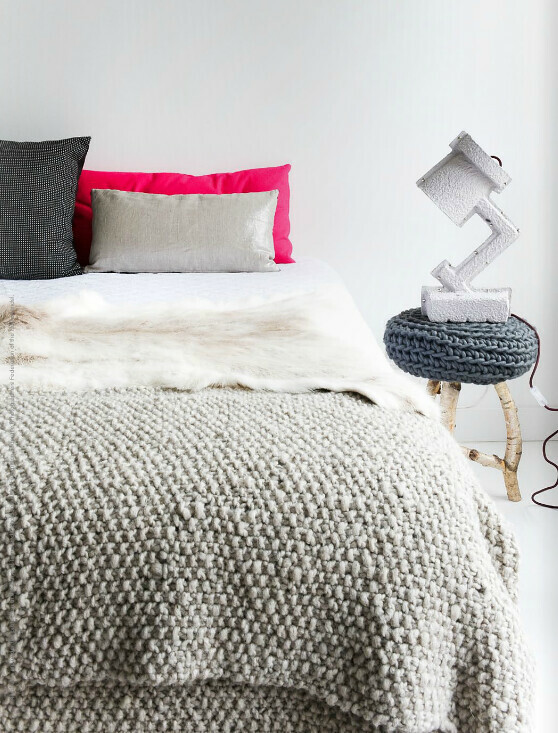 The first room we’re working on is our bedroom, before photo’s in next post…………. House work (as opposed to housework) is gathering pace. Yesterday I met with the stained glass lady from a local craft centre who is hopefully going to restore the stained glass front door. Unfortunately she informed me that the glass was installed in the 1980s. It’s still beautiful and I’m treating it as a piece of art, even if it’s not original. And yes, I did just refer to a piece of 80s restoration as ‘art’. More on that when the quote comes through. 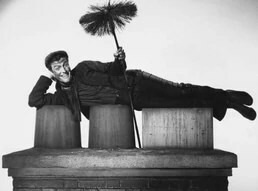 The only snag with the chimneys (there’s always something isn’t there?) was the lack of chimney pot for the sitting room that means the weather has unbridled access to the interior brickwork. When the priority jobs are done I will have to get hunting for a replacement at architectural salvage yards. Let’s not think about how much that will cost for the moment. I love this house. 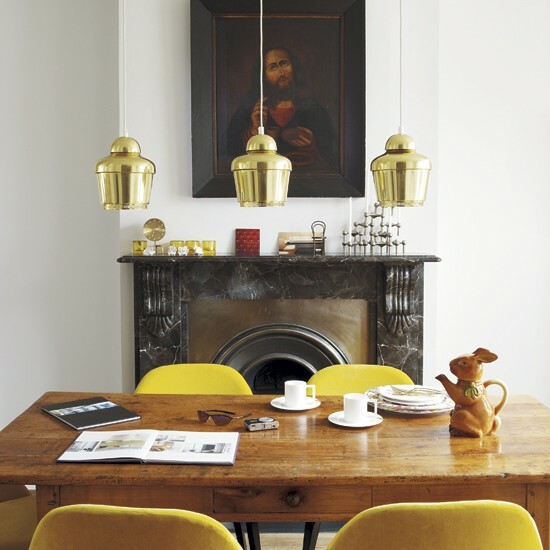 Once you look beyond the eccentric colour schemes, dust and artex it has such lovely bones. 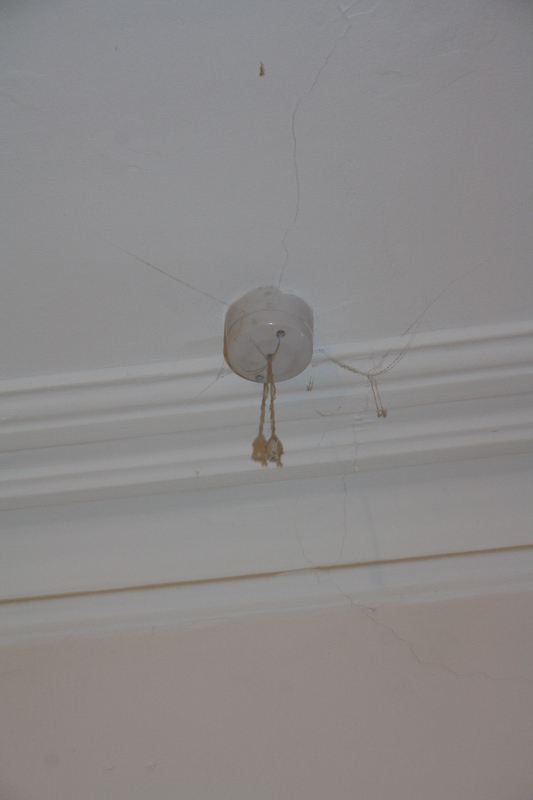 I was pottering round with a screwdriver removing funny little corner shelves and brittle, yellowing curtain tracks. I couldn’t resist sticking the point of the screwdriver down the crack in the boarded-up second bedroom fireplace (can you spot a tool-related mischief theme here?) 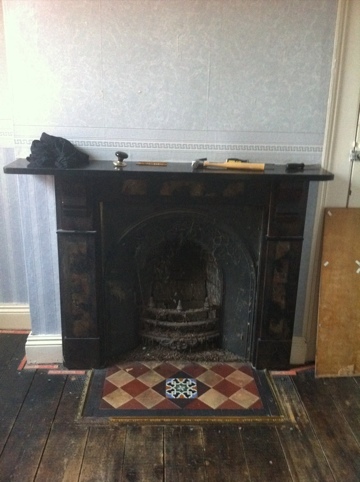 I expected to find a gaping hole, or a dodgy old gas fire, but lo and behold there was a beautiful cast iron fire surround, albeit covered in bird poo. It has me wondering whether it was covered because the previous owners thought it was ugly, or a risk to small children, or something else?